KATHMANDU, July 24: Following his mother's request to undergo a checkup, Dr Govinda KC provided his blood for tests, for the first time since his forced airlift from Jumla. Dr KC's mother Mitra Kumari KC, 80, who visited him Sunday evening, was disheartened by the news that he had rejected any medical checkup . But following her special request, his blood was tested, according to Dr Bishad Dahal of Tribhuvan University Teaching Hospital (TUTH). 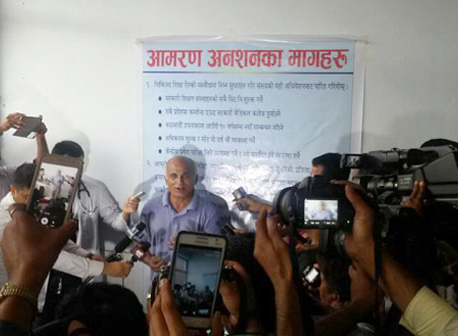 "Dr Divya Singh appealed to Dr KC and his mother to allow checkups. 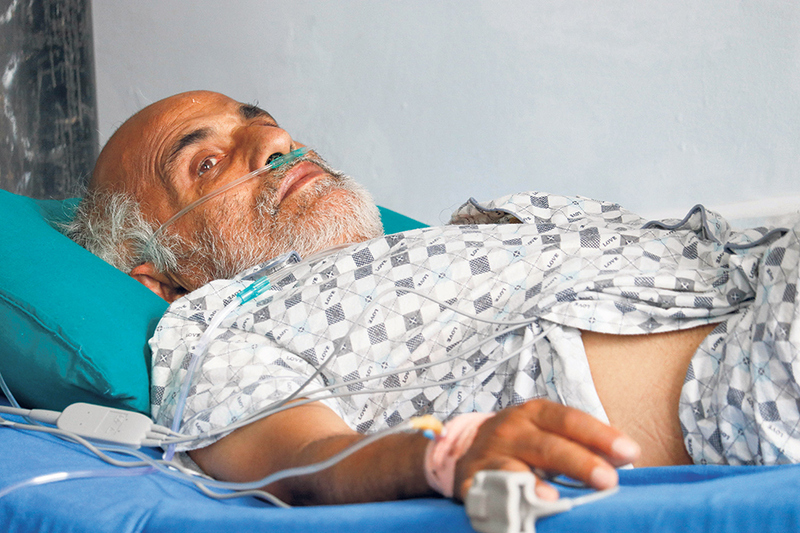 After 45 minutes of talks, Dr KC agreed to the blood test." Doctors are very worried following the blood test report . "All the parameters are alarmingly irregular," said Dr Dahal in a statement. "Levels of WBC, glucose, potassium, magnesium, and calcium are very low. Oxygen level in the blood is decreasing rapidly. He has been put on oxygen mask. He cannot speak now. Anything can happen any time. So he needs to be treated in CCU." On the 24th day of his latest fast-unto-death Monday , Dr KC's condition is deteriorating seriously, with acute complications setting in . However, the government and leaders of the ruling parties are strongly against taking any initiative for talks with him to address the demands he has raised in the interest of ordinary people. His condition is deteriorating critically day by day, according to doctors attending to him. Dr Dhundi Raj Paudel, senior vice president of Nepal Medical Association (NMA) and ethical committee member of the Nepal Medical Council (NMC), said that the 24-day period is a very critical phase. Multiple organ failure can take place any time. The heart can stop functioning, the kidneys may get damaged, infection can damage the lungs and cause imbalance in body fluids," he added. 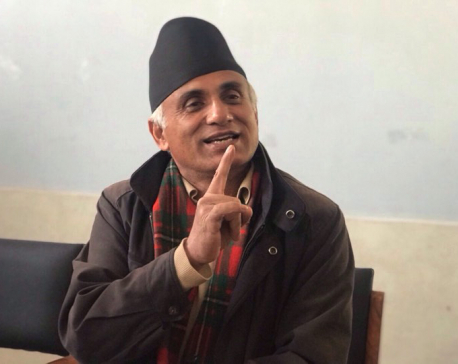 Dr Jivan Kshetry, a member of the talks team representing Dr KC, said that it is mainly three complications that can appear in one's condition after a hunger strike of more than three weeks. "As the food intake stops , the fat and protein start dissolving in course of the basic metabolic rate (BMR), which gradually diminishes," said Dr Kshetry. "Diffuse atrophy complication, in which the intestine cells start receding, increases. The quantity of electrolytes in blood decreases in the absence of food intake," he said. "There is a high chance of fainting and instability in pulse rate or heart beat due to feeble health condition." Dr Kshetry urged the government to hold talks immediately and solve the problem to save Dr KC's life. The senior orthopedic surgeon and professor at the Institute of Medicine (IOM) has staged fast-unto-death for a total of 190 days as of Monday to press for reforms in the medical sector. Over the last six years he has staged hunger strikes seven times under Nepali Congress-led governments, six times under communist-led governments and twice under the Khil Raj Regmi government. Dr KC, who first launched a hunger strike in July 2012 , started his 15th hunger strike from June 30 in Jumla. Dr KC's major demand with the government is withdrawal of the Medical Education Bill registered in parliament after changing major provisions in the earlier Medical Education Ordinance. He has insisted on bringing the Medical Education Act without making any changes in the ordinance. The ordinance has a provision for 75 percent scholarships in government medical colleges and a restriction on opening new private medical colleges in Kathmandu Valley for the next 10 years. The ordinance has also provisioned not allowing a university to grant affiliation to more than five private medical colleges, as per the recommendation of the probe panel headed by Prof Kedar Bhakta Mathema, former vice chancellor of Tribhuvan University. Meanwhile, NMA, the professional organization of doctors, decided on Monday that doctors and health workers would provide their services from alternative places from Tuesday, as part of protests against the government. "The registration of patients and checkups for them will be carried out from places such as the open grounds at health facilities," said NMA Vice president Dr Paudel. "We will go for stringent protests in the next phase but will not deprive patients of treatment," he added.